Hampshire based Solardome Industries has won a top environmental award from The Green Organisation at its Green Apple Awards, which took place on Monday. The Southampton firm was crowned Green Champion 2014 in the Built Environment Construction Category for an eco-home project involving its new SOLARDOME PRO system. Solardome beat off competition from more than 500 other companies to be presented with one of two champion awards at a glittering ceremony at London’s futuristic venue, known as The Crystal. Judges were drawn from the Environment Agency, the Chartered Institute of Environmental Health and the Chartered Institution for Wastes Management, as well as other independent bodies. The panel heard how the PRO system was developed for an eco-home in Norway where a 15 meter glass and aluminium dome was projected over a sustainably built COB house made from wood and straw. The design not only protected the property from wild arctic winds and severe snowfalls, but also drastically reduced energy consumption and building maintenance whilst regulating the climate to create a Southern European-style garden. In addition, judges liked how the PRO system was highly durable, with a lifespan of 100 years, and could be completely recycled at the end of its long life. 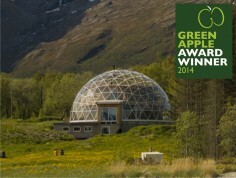 As a result of this success Solardome Industries has been invited to have its winning awards submission published in The Green Book – the leading international work of reference on environmental best practice. Furthermore, it is now likely to represent the UK in the European Business Awards for the Environment. Managing Director Pippa Bailey said: “Individuals, businesses and other organisations like schools are striving to reduce bills and cut their carbon footprints by investing in more environmentally sustainable architecture. “All of us at Solardome Industries are absolutely delighted that The Green Organisation has recognised us for innovation in a build project that is both collaborative and sustainable” She added. The Green Organisation is an independent, non-political, non-activist, not-for-profit environment group dedicated to recognising and promoting environmental best practice. The Green Apple Awards began in 1994 and has become established for recognising environmental endeavour among companies, councils, communities and countries.